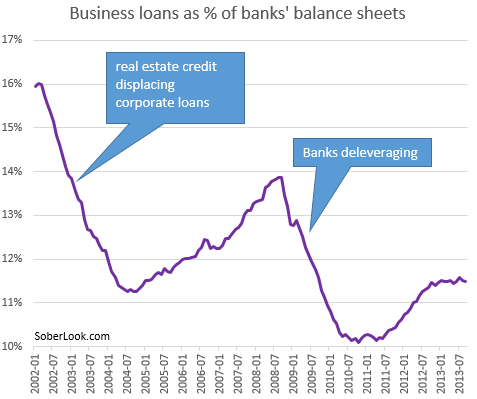 Here is a simple question: what percentage of US banks' balance sheets is taken up by loans to businesses? The answer may surprise some. It's just under 11.5%, down from about 16% some 10 years back. Banks began preferring real estate loans (particularly commercial real estate) to corporate credit in the early part of last decade. That didn't work out so well (see post). Since the financial crisis, banks' deleveraging sent the number to new lows. The percentage began to rise in 2011 but has stalled again this year. The result of Basel-based regulation has been the reliance on corporate ratings for capital requirements. Loans of companies without a strong rating or with no rating at all require significantly more capital to hold on balance sheets. And loans to companies with strong ratings pay such a low rate these days, it eats into banks' profitability. This is especially true for the middle market and lower middle market companies. Outside of basic inventory, equipment, and receivables financing (mostly short-term), banks remain cautious. It doesn't mean however that credit to companies is not available. In fact multiple lenders have been stepping into banks' domain. BDCs, CLOs, credit/mezzanine funds, bond/loan retail funds, etc. have been providing credit to businesses in the US. That transformation to non-bank lenders over the past decade has been quite spectacular - especially in the middle market. When you hear all the pundits talk about "shadow banking", they usually miss the fact that most corporate loans now come from outside the banking system. So the next time your medium-sized business needs some long-term financing, you may get a better answer from your not-so-local BDC than your local bank - particularly while credit markets remain hot.